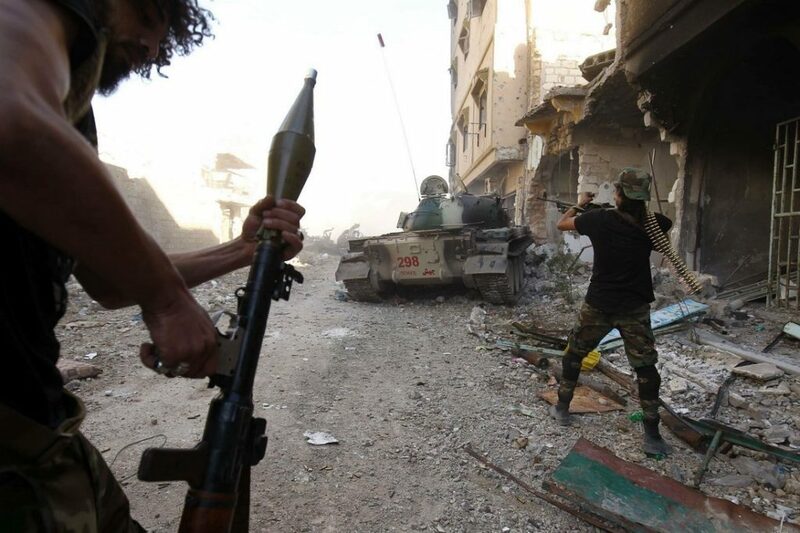 After local forces booted the Libyan branch of Islamic State from Sirte and Benghazi in 2016 and 2017, the terror group reorganized and launched counterattacks targeting both the Libyan National Army and that regime’s rival, the Government of National Accord and associated Misrata militias. But ISIS’s survival in the region has not motivated the competing regimes in Libya to set aside their differences. An already complex conflict could grow more complex as ISIS again mobilizes in a war-torn country that hasn’t had a single national government since 2011. In May 2017, ISIS targeted a convoy belonging to the Misrata Third Force. American raids on ISIS camps in Libya escalated after that. At the end of September 2017, U.S. drone strikes killed 17 ISIS militants southeast of Sirte. But the terror group still retained the ability to mount its own assaults. On Oct. 4, 2017, Islamic State claimed responsibility for the suicide attack on a court complex in Misrata that killed at least four people and wounded nearly 40. On Nov. 17 and 19, 2017, another two U.S. drone air strikes struck ISIS camps near Fuqaha in central Libya. Meanwhile, the LNA and its rivals have been busy slaughtering each other. In late October 2017, an LNA special forces unit allegedly massacred 36 men in the district of Al Abyar, east of Benghazi. Forces affiliated with the Government of National Accord killed 28 people, including some captured LNA soldiers, southwest of the Libyan capital. The Egyptian air force bombed a supposed militant band preparing to cross the Egypt-Libya border, killing 20 people including civilians. Current dynamics play into the hands of extremist groups, including ISIS and Al Qaeda. With the LNA and GNA busy fighting each other, the Saraya Defend Benghazi, also known as the Benghazi Defense Brigade — an Islamist militia group with ties to Al Qaeda — has teamed up with the Petroleum Facilities Guard group and moved into Libya’s oil crescent. In December 2016, a convoy of around 150 SDB and PFG vehicles left Al Jufrah in central Libya and split into two sections as it approached the oil crescent. One of the convoy’s two sections attacked Nofaliya and then the town of Bin Jawad, 20 miles west of As Sider and the other section hurried to make contact with LNA ground forces, apparently in order to make it more difficult for the LNA’s helicopters and MiGs to strike from above without also endangering friendly forces. Despite this, the LNA’s aircraft struck back hard and repelled the attack. Three months later, 50 SDB and PFG vehicles seized An Nawfaliya, Bin Jawad, Es Sider and Ras Lanuf. It seems that the convoy went undetected, despite the United Arab Emirates having deployed Wing Loong drones to Libya’s Al Khadim air base in order to support the LNA. Ten days later, after several counterattacks, the LNA — with UAE and Egyptian air support — retook the cities one by one as well as the airport at Ras Lanouf. But the LNA’s hold on the oil crescent is tenuous. Distracted by its conflict with the GNA, the LNA could leave the oil-rich region open to militant attacks. ISIS and Al Qaeda have already proved they can exploit the LNA-GNA fighting. There’s no reason to believe the terrorists will alter their plans.